Deanston 12 years old is a fine mellow malt with a fragrant, fruity flavour and a lingering sweet aftertaste. Deanston Single Malt Scotch Whisky is produced at the Deanston Distillery, which is situated outside the town of Doune, Perthshire, and lies on the banks of the River Teith, where the waters used for distillation are considered to be the purest in Scotland. 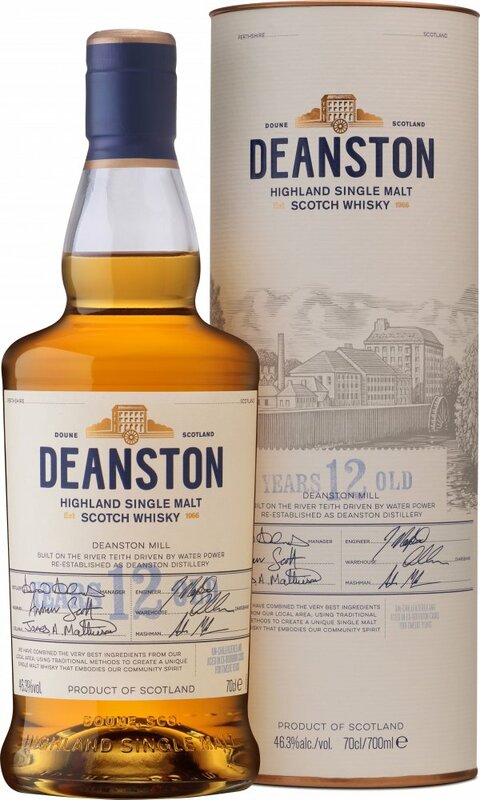 Deanston is a pale, distinctive malt, distilled from unpeated malted barley and is available as a 12 and 17 years old Single Malt Scotch Whisky. It is exceptionally easy-to-drink and is regarded as a perfect expression of a Perthshire Highland Malt. Bottle design and box changing soon.